Do you remember this house that I crashed a few months ago that belongs to my brother and sister in law (and their adorable kiddos, too)? Well, I was visiting just recently and there were some new additions to baby Stella’s room that I just had to share. 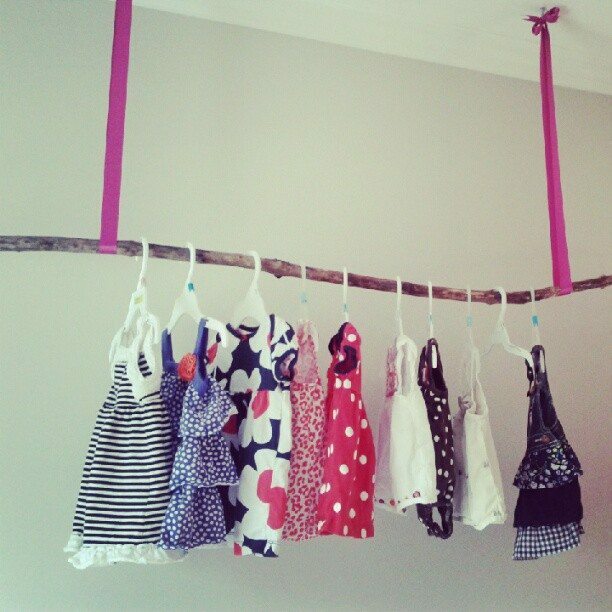 First up was this super cute idea to display all of Stella’s pretty summer dresses. Alexandra (my crafty sister-in-law) had found a big driftwood stick, attached two pieces of sturdy ribbon to it, and hung it on the ceiling. How cute is that? 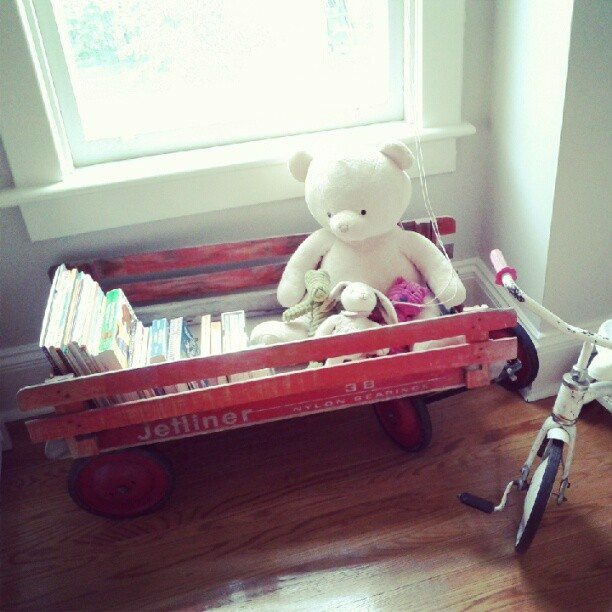 Next was this vintage red wagon. We had actually spotted it together at a small rural antiques/flea shop on a recent family trip. Alexandra scooped it up for $25, gave it a good cleaning, and then filled it with Stella’s books and stuffed animals. Such a cute way to add a bit of storage in a kid’s room without going the usual bookcase/baskets route. 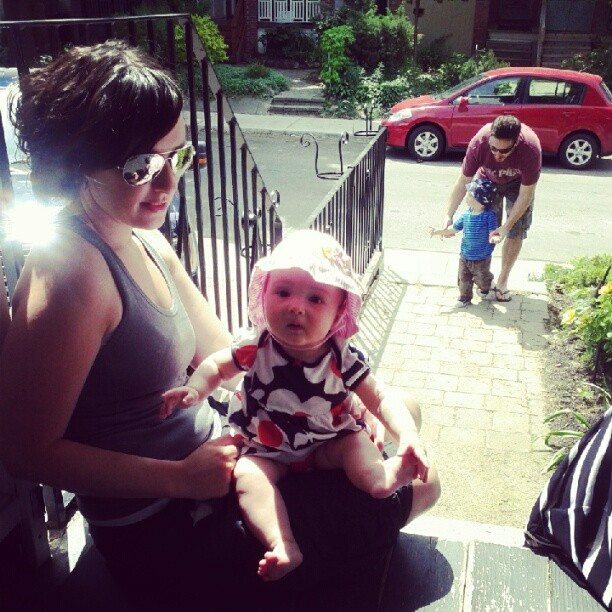 And just for good measure, check out my cutie-patootie niece and nephew here. Aren’t they just the sweetest things? 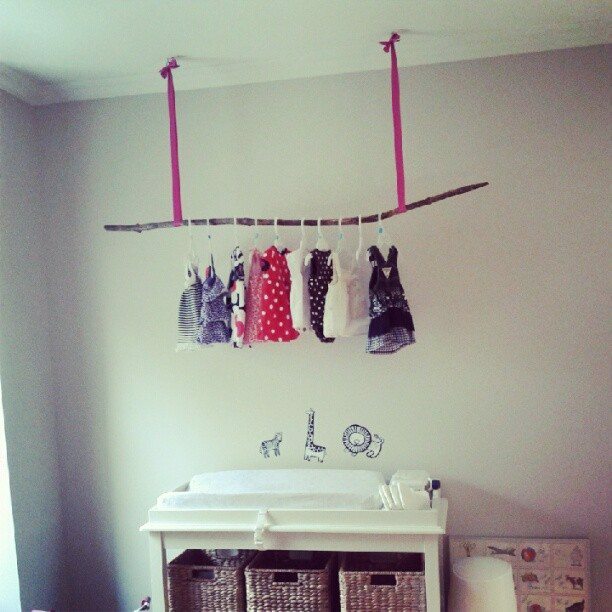 Aren’t nurseries the most fun thing to decorate? I’m helping some friends do theirs right now (they are expecting their first baby this fall), and I’m loving how creative, colourful and whimsical it is. How about you guys? Decorated a nursery before? Used sticks or wagons somewhere in your house? Do tell. OMG i love the additions – the branch is amazing! And the name Stella is sooo adorable! I know, right?! Love it! that is soo! cute and total genius! !